all it takes is a necklace! 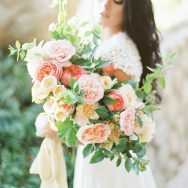 There is such an enormous amount of energy required to make a wedding perfect in every way. Of course there are always little hiccups and trials along the way, but all too often these are forgotten; the memories are wonderful, and the little malfunctions are later laughed at (we hope)! 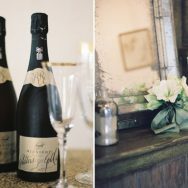 We all know planning is the key to making the day go as smoothly as possible, whether you engage a wedding planner, or you and your bridal party have what it takes to account for every detail, leaving no stone unturned. Your Groom’s personality:Is he the traditional or conservative type or is he a little more contemporary or perhaps even flashy. Perhaps he has a unique and outrageous style – nothing mediocre for him! You see where I’m going with this. Before anything else, the ring you choose must suit his personal style. If not, he most likely won’t feel comfortable wearing it and the wedding band is a jewellery accessory to be worn everyday so he needs to be comfortable. Custom designs and sizing: If you find something you really love, but you can’t get it in the size you want, try somewhere that offers custom designsand sizing. This ensures that your ring is perfectly suited to your man and you will have the pleasure of knowing that it is uniquely his. Allow some extra time for custom designs; they generally take a little longer than others. Quality, Quality, Quality: And lastly, make sure that you buy quality, for this ring will last a lifetime! Who else is ready for proposal season to heat up? It seems like as soon as the temperatures dip, and the closer we get to the holiday season, the more we see new shiny rings on fingers! And with so many options out there today for rings, we thought we would partner with Clean Origin to navigate the decision making process. You’ve likely heard of the four things to look for when you’re searching for a diamond — cut, clarity, color and carat. But what exactly do all of those mean? And why are they so important to your diamond? It’s common for people to mix up cut with the shape of the diamond. However, the cut is actually a grade of how well the diamond interacts with light, and how well the jeweler plans, maps and hand cuts the facets on each individual diamond. 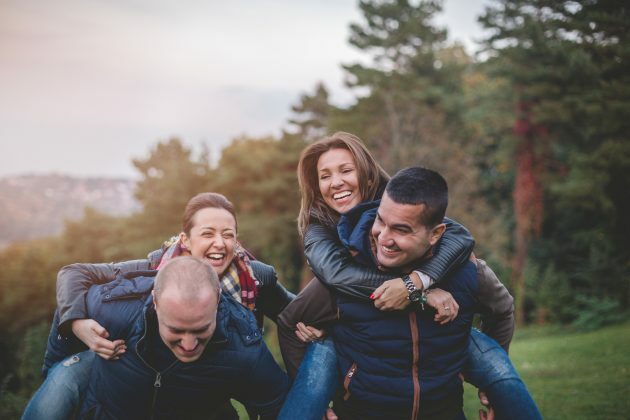 It’s no surprise that we all want our diamonds to shine, and how well your diamond is cut will ultimately be the deciding factor in how much sparkle you get. The cut of your diamond will be: Good, Very Good, Excellent, Ideal, or unavailable. Obviously, the better the adjective, the better the diamond cut. It’s also common that your diamond might not possess a cut at all. For some fancy-shaped diamonds, such as cushion, there is no cut grade. This is simply because there is not a grading system in place to measure the light return. If you’re interested in one of these shapes, simply talk with your jeweler about what else to look for during the purchasing process — often you’ll be looking for specific qualities in specific cuts. The clarity of a diamond is a bit more self explanatory. Due to the high amounts of pressure that’s used to create a diamond — either in the earth’s surface or in a lab — it’s common for these jewels to include internal characteristics called ‘inclusions’ or external characteristics called ‘blemishes’. Naturally, the fewer characteristics that the diamond has, the more expensive it becomes. When you’re searching for your diamond, the clarity will includes one or two letters and a number — SI2 for example is the lowest you would want to go on the scale if you do not want to see any visible imperfections. Although a pink diamond might be turning in your head right now, when you hear about color in diamonds, it’s actually referring to the absence of color. The color of a diamond is graded on an alphabetical scale, starting at D and ranging all the way down to Z with D being a colorless diamond and Z being yellow. Most of the time, you’ll want to look for a diamond that is higher up on the alphabet — yellow in a diamond can actually leech the sunlight and minimize sparkle. It’s important to note that the differences from one letter to another are often minute — go with your eye, your gut and a trust jeweler. Finally, you’ll have to choose what carat size you want. Carat refers to the actual weight of the diamond. As you probably already know, size is a huge contributor to the price of the stone. It’s extremely important to understand some of the terminology around carat. For example, if you see “tw”, that means “total weight”. Unless marked otherwise, this could be the total of the center stone and the accent diamonds together. 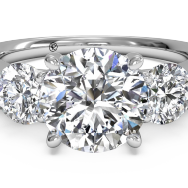 If you want a center stone alone that weighs a certain amount, make sure you specify! 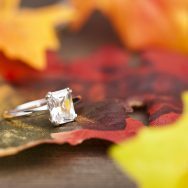 However, some small differences in carat size can be almost absent to the naked eye, but can cause a dramatic price jump. Make sure your jeweler knows your budget and is getting you the best bang for your buck in that range. We know, we know, your head is starting to turn with all of these numbers and letters. But don’t worry, your jeweler should be able to help you with all 4 C’s, but it’s important to be educated so that no one tries to rip you off. And, always remember, this is your decision! Sometimes choosing one ‘C’ over another might be the right choice for your style or budget. It used to be that you had very little say in where your diamond was sourced. In fact, if you walk into the average jeweler, it’s unlikely that they will be able to tell you where your diamond came from. With lab-grown diamonds, this is no longer the case. Lab-created diamonds, like the ones from Clean Origin, give you an ethical, environmentally friendly and less expensive option for diamonds. Not only does Clean Origins offer engagement rings, but you can also find loose diamonds, wedding bands, wedding sets, beautiful earrings and also bracelets! 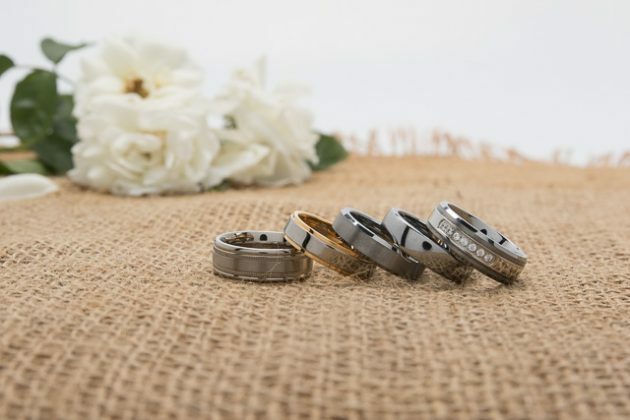 With over 100 ring styles available, free shipping, free resizing, a 100-day return policy, and a lifetime manufacturer’s warranty – using them is a no-brainer! Ethically sourced, environmentally friendly diamonds may be their product, but their business is making sure that the individuals purchasing and receiving those diamonds are 100% satisfied. No matter how small the detail or how many questions you have, they’ll be there to help you throughout this important decision. Engagement rings are a big ticket item. For most people, engagement rings are one of the biggest purchases they’ll ever make. And it’s easy to see why people are ready to drop a lot of cash on their ring— after all, engagement rings are meant to symbolize everlasting love and people want the quality of their ring to reflect that. 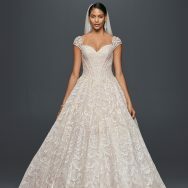 Plus, diamonds appreciate over time, so engagement rings are also an investment purchase that people want to get right. So, what exactly are people spending on engagement rings? Across the US, the average amount spent on an engagement ring is $6,351. Though, the amount spent per state ranges from $3,518 to $10,241, with the lowest average coming from Utah and the priciest coming from California. While it’s good to consider how much people are spending on their engagement rings, it’s also important to remember that your budget doesn’t have to hit that average number. Every person’s unique situation is different— the most important thing about your engagement ring budget is that it’s comfortable for you. No one wants to start a marriage with strained finances or debt. So, how do you buy the perfect engagement ring when you’re working within a budget? We partnered with Fancy Lab to answer that question! The first thing you should do is make sure you know exactly what your budget is. Some people have a range they look within and some people just set a hard upper limit. To figure out your budget, just take an honest look at your finances and think about what you’d be completely comfortable spending. Once you know your budget, it’s time to start shopping around. If you’ve never bought an engagement ring before, you might not know that engagement ring settings are usually sold separately from the engagement ring’s center stone (which is, traditionally, a diamond). So, keep that in mind while you’re shopping. If you’re shopping online, most retailers have handy filters that will allow you to only look at settings or diamonds within certain price ranges. But one online retailer, the luxury jeweler RockHer has taken diamond “filtering” up a notch with their online diamond concierge, ROSI. ROSI, a combination of algorithm and AI (powered by IBM’s Watson! ), was designed by the team at RockHer to help make what used to be a very difficult shopping decision very simple. Essentially, ROSI works by getting a few pieces of information from whoever’s using her, then sorting through thousands of diamonds and showing the user only the very best ones within their criteria. So, in a nutshell, ROSI helps you find the best diamond within your budget, taking all the confusion and work out of the diamond shopping process. Plus, she does it faster than even an expert gemologist could. 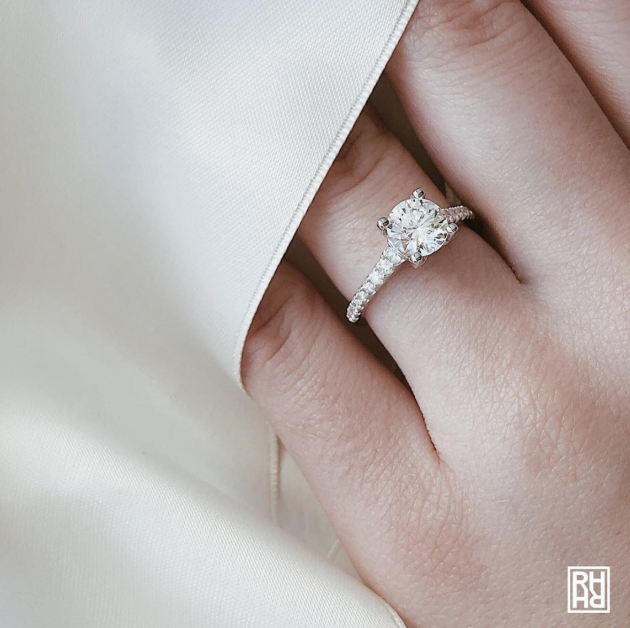 And RockHer is a full stop shop— you can use ROSI to find your ideal diamond and then pair that diamond with your ideal setting right away (or vice versa). 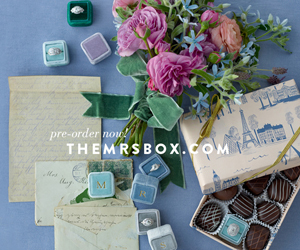 They have every imaginable setting style, from intricate vintage settings to sleek modern rings. 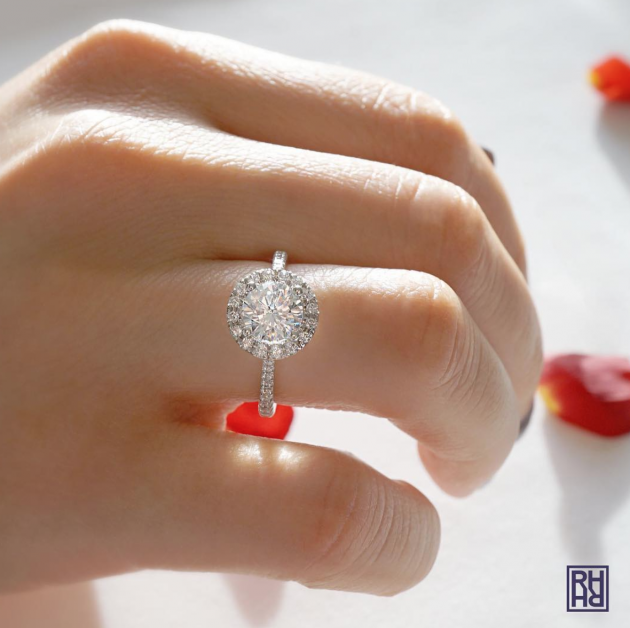 So, the answer to the question of “how to buy the perfect engagement ring without breaking the bank?” Figure out your budget then use ROSI, an AI advanced digital diamond gemologist, to help you sort through the rubble and find your perfect ring. Valentine’s Day is right around the corner— do you know what you’re getting your Valentine this year? Picking out just the right gift for your sweetheart can be tricky. Everyone wants to give their Valentine something that will make them feel special and appreciated. That’s why so many people opt to give jewelry on Valentine’s Day. Fine jewelry is beautiful and romantic— plus, it will last a lifetime. To help you pick out an amazing gift this year, we’ve partnered with Fancy Lab to put together this V-Day Gift Guide, full of gorgeous pieces that will make her heart skip a beat. Is there any jewelry more classic and gorgeous than a simple pair of diamond studs? These earrings are the definition of classic beauty, featuring two radiant white diamonds set in 14k white gold. If your Valentine doesn’t have a pair of diamond studs in her collection yet, she’ll be overjoyed to receive them this year. This diamond pendant is wearable, unique, and absolutely beautiful. 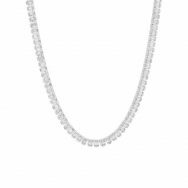 Diamond pendants are a classic jewelry item that can enhance any outfit; their simple radiance goes with everything. The oval-shaped diamond in this piece adds a unique touch to this diamond pendant, which would more commonly have a round or princess shaped diamond. Black diamonds have been rising in popularity in the world of fine jewelry. Their bold, rich look adds a cool, edgy feel to every piece they’re used in. These black diamond studs, securely bezel set in 14k white gold, provide a boldly beautiful way to wear these distinctive diamonds. Rose gold has grown quick popularity in fine jewelry and has become the new staple. Rose gold is a popular and desired metal choice along with its counterparts yellow and white gold— if not even more so. This beautiful rose gold solitaire ring elegantly pairs a soft rose gold setting with a unique, yet classic cushion cut white diamond. 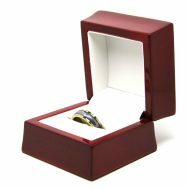 This ring is a great choice if you’re thinking of popping the question this Valentine’s Day. Diamonds are a girl’s best friend— so these diamond hoops featuring 50 brilliant round cut diamonds might just end up being her soul mate (after you, of course). These dazzling earrings, with their twin rings of radiant white diamonds, are classically beautiful and simply to die for. These pieces are from Diamond Studs, known for their classic and timeless jewelry selection. Their sister company, Diamond Wish, is known for their unique engagement rings, like the gorgeous blue and white diamond ring pictured above. This ring, which features an elegantly scalloped halo of diamonds around its blue center stone, is a beautiful example of an alternative engagement ring. Alternative engagement rings are a great change to classic white diamond engagement rings. 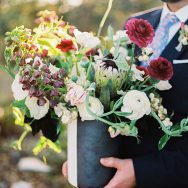 They’re great for the modern bride that seeks out a more unique and personal feel and isn’t afraid to deviate from tradition. Alternative engagement rings are also having their moment in the spotlight right now! Once you’ve picked out your Valentine’s Gift, consider this: how you give your gift can help to make it feel even more special. Here’s a gift giving idea: give her a handmade Valentine’s Day card along with her new piece of jewelry. Making her an old school, handcrafted Valentine’s Day card (complete with your personalized words of devotion, of course) is sweet, thoughtful, and charming. You can either give her her jewelry at the same time as her handmade card or hide the jewelry and write clues in the card to help her find it. Either way, she’ll love that you went the extra mile to make her Valentine’s Day even more special and memorable. Well, if Erin’s comments about her Air Force husband and their love don’t make you tear up, we don’t know what will. The couple fell in love fast and hard and Jack’s waterfall proposal soon-after was totally romantic. The couple has endured many long-term separations, including Jack’s deployment to Afghanistan, yet they remain strong and in love. 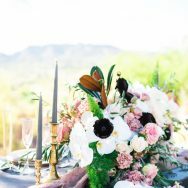 Erin and Jack enlisting the talents of Elyse Alexandria Photography to mark their one-year anniversary of marriage with a gorgeous desert engagement session and we’re totally smitten. 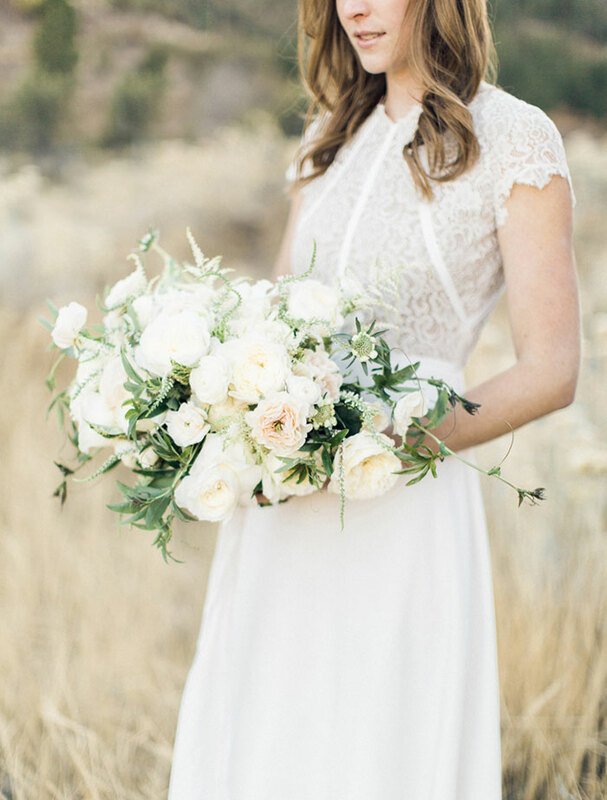 From the Bride: My husband, Jack, is the most genuine, straightforward, and generous man I have ever met. When we first met, we immediately became exclusive and every hour we were not at our jobs, we were together. We both fell fast and hard—I knew I wanted to spend the rest of my life with him. Almost 6 months to the day after we met, we were in his hometown in Northern California hiking to a waterfall. Jack asked a stranger to take a photo of us in front of the waterfall and after a few smiles, Jack turned to me. When he started telling me how much he loved me and cared for me I knew exactly what was going on. He then got down on one knee and asked me to marry him. I said yes, of course! Not only did he propose with a beautiful ring, he had the ring custom made from a boutique jewelry shop in Washington. He even had our initials engraved on the ring. To this day, I still stare at it every day and smile. Twenty seven days after Jack proposed, he left for a six-month deployment to Afghanistan. From that time until now, we have gone through many short-term physical separations because of the Air Force. Enduring those separations is not always easy, but through the hard times Jack has stayed the same man I fell in love with only a few months after meeting him. He encourages me, he pushes me, and he supports me. He makes me feel beautiful and loved with not only his words, but his actions as well. He is my dessert recipe guinea pig, my handyman, and my gardener. The months and days leading up to our wedding and our wedding day went by so fast. Even though we’ve only been married for a year, we’ve already moved from Northern California to a home in Las Vegas. And now that it’s been one year since our wedding and we have finally settled into our married life, we wanted to celebrate our marriage and our new home.